Elephant seals are the largest seals on earth. Males grow to over 13 feet long and weigh up to 4,500 pounds. Females are slightly smaller, measuring up to 10 feet in length and weighing in at 1,500 pounds. Elephant seals are mammals, meaning that they are warm-blooded, breathe air using lungs, have fur to stay warm, give birth to live young, and nurse their young using milk. Elephant seals also have thick blubber to keep them warm during cold-water migrations. Elephant seals eat rays, skates, fish, squid, and sharks that live near the bottom of the ocean. Elephant seals will dive to depths of 2,500 m in search of their prey. Elephant seals spend 90% of their lives underwater looking for food. The breeding season begins in December when the first males arrive onshore. By late December, females begin to arrive onshore. Approximately 3-6 days after arriving, females give birth onshore to pups that were conceived during the previous mating season (1 year before). They have a delayed gestation period of seven months since the pups wouldn’t survive if there were born at sea. Pups will nurse for 25-28 days, gaining weight at a very rapid rate. Pups will grow from 75 pounds at birth to 250-350 pounds in less than a month (www.parks.ca.gov). At the end of the nursing period the pups are abruptly weaned and left alone on beaches. The following video footage shows the importance of the mother elephant seal’s trip to the open ocean for foraging in order to meet the energy requirements necessary for nursing her young pup. Weaned pups, called “weaners” are left on beaches after adult males and females leave to forage. Weaners aren’t born with the ability to swim or hunt, so they are very clumsy and curious during their first trips out to sea. After a lot of practice close to shore they begin venturing northward to feed off the coast of Washington, British Columbia, and Alaska (www.parks.ca.gov). Like all mammals, elephant seals molt their skin and fur. Unlike most mammals, though, they molt all their skin and fur all at once, called a “catastrophic molt”. Weaners will molt their skin and fur before northward migrations in April-May. Females return to shore and also molt between April-May, while males return to shore to molt from May-August (www.parks.ca.gov). The video below, which features footage from the TOPP project, shows how scientists carefully monitor the elephant seals’ breeding and molting behaviors to know when the optimal time is for placing a satellite tag on the animal. The seal’s heart rate slows while diving to reduce blood flow to the body. This process is called bradycardia. Warm blood flowing out of the core of the seal’s body and towards it’s flippers dumps heat to cool blood returning from the flippers to the core of the body. This ensures that valuable heat isn’t lost while blood is in the seal’s flippers. This process is called counter-current heat exchange, and is used by other animals such as tunas, turtles, and sharks to conserve heat in the core of the body. Elephant seals have compliant chest walls that allow their lungs to completely collapse under pressure while deep diving, and then re-inflate when the seal returns to the surface. Elephant seals were previously hunted for the oil in their blubber, and in some cases for their food and skin. It is thought that over 250,000 individuals were hunted in the 1800s. Elephant seal populations reached near extinction by the end of the 19th century, but have since recovered following a ban on hunting. The elephant seal now occupies most of it’s original range. Currently, elephant seals are protected in the U.S. by the federal Marine Mammal Protection Act, and are not of particular conservation concern. Elephant seals return to the same beaches year after year for breeding and molting. While onshore, elephant seals have the potential to interact with humans. Some breeding beaches are protected;by law to prevent negative impacts to elephant seals while onshore.Some current threats to elephant seals include entanglement with marine debris, collision with boats, and competition with the fishing industry for prey. Elephant seals are also threatened by human activities common to all species, including pollution, habitat degradation, and climate change. Elephant seals are an ideal organism for using electronic tags. They are highly pelagic and have a proven capability for carrying the electronic tags that can acquire data on the ocean environment. Because of the animal’s size, they are able to wear large instruments with minimal impact on the animal’s behavior. These tags are able to compress data so that more information can be transmitted through the Argos satellite. These tags can record salinity, temperature and depth. The elephant seal tagging efforts to date have provided a detailed understanding of their movement patterns, unparalleled among open-ocean species. By studying the movement patterns of the elephant seals with ocean environmental data, new insights of the physical and biological factors driving the migration of can be attained. The following video, Into the Deep with Elephant Seals, explains the incredible comeback from near extinction that elephant seals have made, teaches about the unique adaptations these ocean Olympians have for their habitat, and describes how tracking technology has led to a deeper understanding of their behaviors. 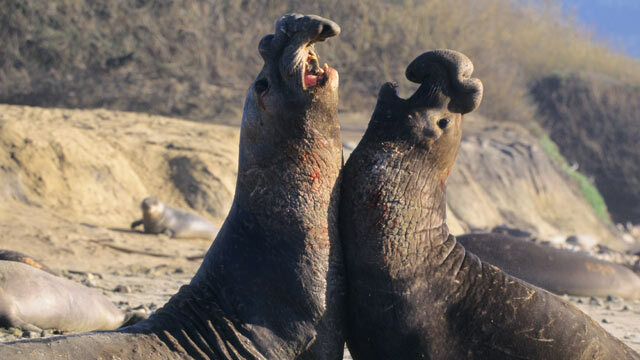 Listen to the vocalizations of two male elephant seals. Listen to the vocalizations of a female and her pup.